Choosing where you are going to go on vacation is exciting but how do you decide where to stay? With the rise in vacation rental websites like airbnb and VRBO, there are more options than ever for where to make your home base. We have done both hotels and vacation rentals, sometimes within the same trip. We think that there is a place for each of them and pros and cons no matter where you book. Here are some of the reasons why you might want to look at one over the other. Extra space: Unless you have a family suite, a hotel room is just that, a room. With a vacation rental you typically have a common area separate from the bedroom and once your kids are in bed, this can be the perfect spot to watch T.V. or have a glass of wine with your husband without worrying about the volume, lights or feeling trapped for 3+ hours a day. Vacation rentals tend to have more of the comforts of home. For example, in Hawaii we stayed in two apartments booked through Airbnb. Both were stocked with beach towels and sun umbrellas, boogie boards for the adults and sand toys for the kids. We had access to bikes, a cooler, and a washing machine. This isn’t universal but most vacation rentals advertise these perks on their listing and they can make planning a day at the beach with your family that much easier. Eating out is a traveling expense that adds up quickly. Not to mention eating out at restaurants with kids isn’t always easy or enjoyable. The last thing you want is to be trying to find multiple restaurants a day for hangry little humans (or big humans). This is especially true if you are dealing with allergies or picky eaters. Being able to grocery shop for food that you know your family likes and making meals at “home” can go a long way to making your vacation less stressful and more affordable. Traveling as a group? Splitting the cost of a multibedroom vacation rental can be more cost effective than getting two separate hotel rooms. Our beautiful hotel in Santorini. Chain hotels have standards and if you are used to staying at a chain hotel in one city then you can be fairly confident that you will know what to expect when you get to your destination. Vacation rentals have pictures and reviews but there are generally more unknowns. We have arrived at some destinations at midnight and we were uncomfortable with the idea of trying to arrange to pick up keys from a local renter in an unfamiliar place with all of our luggage in hand. In situations like these we have chosen to stay in a hotel where we know there are 24 hour front desk staff. Indoor pools, outdoor pools, kids clubs, continental breakfast; hotels have tons of amenity options that you generally don’t get at a vacation rental. Depending on the hotel you choose (and the price you want to pay!) you can find just about anything and amenities like these can help parents enjoy a holiday from cooking and doing dishes and keep little ones entertained. We went to Winnipeg in October and knowing that the weather wouldn’t be conducive to lots of outside time we opted for a hotel with an indoor pool. Our daughter loves to swim so we knew it would be a fun experience for her. In Greece, our daughter was 3 months old and it was our first trip as a family. We opted for hotels with continental breakfast and ate breakfast while our little one slept or while one of us got ready for the day. It was so nice to not have to cook or clean dishes, and having a full belly made us feel ready to take on the day. If you want to stay beachfront in Waikiki or in downtown Manhattan, a hotel might be the best option. These are probably locations that are less residential and so it might be harder to find an affordable vacation rental in these spots (though this is not always true, we did stay in an Airbnb at the foot of the acropolis in Athens which was significantly cheaper and more convenient than a hotel). Hotels are known to have lots of hidden fees, from resort taxes to extra fees for parking and internet. Vacation rentals have hidden fees as well, like cleaning fees that vary from property to property. 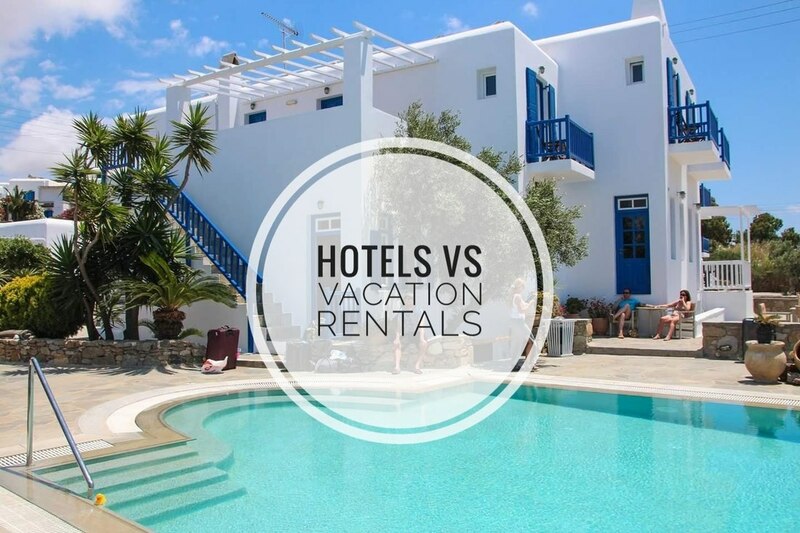 In general we have found that in bigger cities (like Barcelona, Honolulu and Athens), hotels are generally more expensive than vacation rentals. Depending on the city, vacation rentals can be outside of the main tourist areas meaning that it is more likely that you will need a car. If you aren’t comfortable driving in an unfamiliar city, then make sure you limit your search criteria to areas that are accessible by public transit or close to the sights you want to see. When you’re researching accommodations make a list of what’s most important to you. Want to be close to all the action or have a pool and beach at your front door? A hotel might be your best bet. Are you renting a car anyway? Check out vacation rentals and hotels outside of the main tourist areas for more affordable options. Want a vacation from cooking and cleaning? Book a hotel but try to find one with continental breakfast. That way you won’t have to worry about one meal a day and you won’t have to nag anyone to have the beds made each morning. Want more space or think you’ll be spending a lot of time in your room for nap and early bedtimes? Check out whether there are any family suites available and how the price compares to apartment rentals in the area. The extra space will make the down time much more enjoyable for you and your partner. Tell us about your experience! Have you stayed in a vacation rental or do you prefer hotels?